For many finance professionals, the ultimate career goal is to become a CFO. The path to becoming a CFO is long, challenging, and at times unclear. 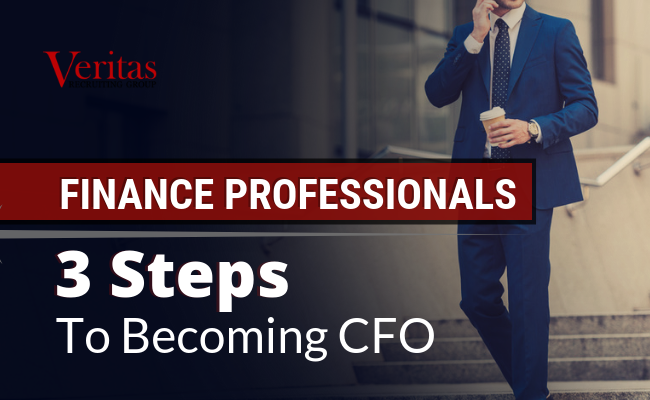 However, there are several steps that ambitious financial professionals can chart that will significantly improve their chances of being considered for a CFO role down the line. Here are three steps that will help financial professionals become a CFO. For young finance professionals, it’s never too soon to start mapping your long-term career goals. But you want to make sure that it doesn’t get in the way of performing at a high level in your current role. For most finance professionals, the road to becoming a CFO begins with working as a financial analyst. Financial analysts are tasked with producing reports and economic forecasts that enable executive decisions regarding capital spending. Financial analysts can expect to be in their role for 3-7 years, which gives them plenty of opportunities to stand out. By demonstrating a strong ability to create accurate and detailed reports and a desire to manage others, a financial analyst will set themselves up for a promotion. A CFO needs to possess financial acuity, but also needs to be a tremendous leader. As a corporate finance professional advances their career towards becoming a CFO, they’ll need to sharpen their leadership skills by effectively managing a team. Typically, the first opportunity to lead a team is by serving as a senior financial analyst. Senior financial analysts oversee a group of financial analysts. They take on increased responsibilities by reviewing all of the financial reports their team compiles and selecting the best ones for a recommendation. The more effective a senior analyst’s team is at producing insightful models and forecasts, the more they’ll stick out to their superiors. This step is critical for aspiring CFO’s. If a finance professional is unable to demonstrate that they are effective managers, they’ll have a very difficult time advancing further up the career path. One of the more unique elements of a CFO’s role is that they typically oversee both the accounting and finance departments of a company. To effectively lead these two separate departments, it’s hugely beneficial, if not outright mandatory, that a CFO has an advanced understanding of each vertical. A person that advances their career solely in one of the two departments will eventually be limited by their lack of knowledge on the other. For people progressing through the finance ranks, it’s wise to take an active approach in acquiring both a sound knowledge of accounting and experience utilizing that knowledge. How? There are a few different ways. Finance professionals can volunteer on a project that requires accounting skills to both sharpen and showcase their skills. Or, they earn certifications or post-secondary education outside of the office. By showcasing your financial forecasting and analytical skills, demonstrating your ability as a leader, and deepening your understanding of the accounting side of the business, you’ll be well on your way to eventually becoming a CFO. Need assistance in accelerating your corporate finance career? Contact us today to learn how Veritas Recruiting Group can help.